Mr. Oberbeck is an Alicia Patterson Fund award winner, on leave from Newsweek, Inc. This article may be published, with credit to S. K. Oberbeck and the Alicia Patterson Fund. London—Of about 40 movies I saw here in the past months, far and away the best of them was an Anglo-American MGM production: Stanley Rubrick’s “2001,” a visually awesome “space odyssey” that put into popular orbit some unsettling scientific speculations and critical philosophical questions. The most significant feature of “2001” was that its true stars were not Keir Dallea or Gary Lockwood (who play two cosmonauts) but roughly two million years of man’s technological development from club-wielding ape to space-walking astronaut. Though present in a fabulous, leviathan array of glossy space-ware, technology in “2001” is presented in apotheosis as a titanic, crimson-eyed, sinisterly soft-spoken computer named Hal 9000 who is capable of demonstrating a startling spectrum of human traits, including mutiny and murder. In fact, technology, functions as plot and action as well as character in this stratospheric, $10-million epic—as direct, visual spectacles of tomorrow’s technological probabilities in operation substitute for spoken dialogue or narration. The silent, majestic lowering of a space-ship into a ruby-tinted moon-crater fitted out like a gleaming steel-and-glass skyscraper is more eloquent than all the sputtering of a control-director’s microphone. One feels certain that the script, written by Kubrick and scientific author-expert Arthur C. Clarke, is purposely parsimonious with human speech. “2001” is, after all, about a new kind of communication—between man and machines. There is a simple reason why Kubrick’s opulent film will go down as a historical benchmark in motion pictures concerning the forbidding imponderables of man’s leap into infinity: “science fiction” has all but become today’s reality. Obviously, the old Captain Video days of spaceships on strings and giant Jellos waiting to ingest voyagers to other planets are gone. The “sci-fi” script today is more a matter of responsible technological forecasting than of titillating flights of fancy: Apollo 6 was scheduled for launching the day “2001” premiered Now York (stellar PR) and radioastronomers had been reporting puzzlingly regular “pulsar” signals from somewhere more than 100-light years away from earth—another piece of promotional serendipity for Kubrick’s epic, which postulates the existence of some superior extraterrestrial intelligence. 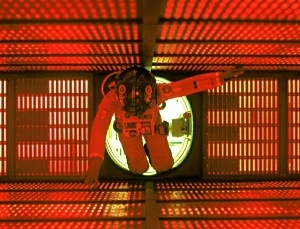 The film, however, was carefully billed as a work of fiction and rightly so, since a computer as developed as Hal 9000 probably will not exist by 2001 and the film describes an interplanetary voyage whose time-table defies Einsteinian theory. But the bulk of its philosophical implications is more fact than fiction—in the sense that Herman Kahn’s Hudson Institute “scenario,” or Jacques Ellul’s technological exegesis are speculative researches or arguments based on probable reality. Whatever scientific freedoms “2001” takes (and Kubrick recruited two of Dr. Werner Von Braun’s NASA experts, as well as consulting IBM and RCA on “hard science” aspects of the film), it is the first popular movie to deal seriously, artfully and authentically with the menacing problems man’s proliferating technology poses. “Outwit” is a fairly provocative word, but in this regard, it is not especially surprising that one of two major plot-lines in the film “2001” involves the sophisticated computer’s attempt, nearly successful, to assume control of an interplanetary space probe by behaving (apparently contrary to his “program”) with what seems like a mind of its own. The probe—an exploratory trip made by five cosmonauts to Jupiter—is occasioned by the top-secret discovery at an American moon-station, of a mysterious, buried monolith (like Hal, a central character) which is obviously something that has been “manufactured,” possibly by a super-intelligent power or civilization that predates man by two million years. Three of these smoothly-tooled, obsidian-black slabs figure in the tripartite movie and require a slight digression to explain. The first of these sinister celestial calling-cards appears in the opening phase of “2001” among screaming clusters of shaggy “apes,”—prehistoric man—one of whom stumbles onto “technology” after touching the towering slab. Following some pop-anthropology water-hole squabbles with rival apes, Kubrick’s man-in-the-making absently picks up a heavy bone and begins flourishing it like a club, subsequently smashing up an animal skeleton, battering down a fat tapir for dinner and finally killing a territorial trespasser at the old water-hole. In a flurry of fluid, nearly surreal cinematic images, the apes go from Ardrey to Clausewitz in only a few minutes. Then the inspired ape, in exultant celebration of his newly discovered power, flings his bone-weapon high into the air, where it spins end over end and visually metamorphoses into an orbiting space vehicle vaulting end over end through the inky ether. Thus, with more than a trace of Pugwash didacticism slanted to our overkill accessories, does Kubrick span two million years of man’s technological development. But it is a cunning metaphorical transition that emphasizes the role technology plays in “2001”—and speeds us to the film’s primary concerns: a dramatization of the new environment of cybernated spaceware and the effects on man of his by now symbiotic relationship to a dazzling, dizzying array of machines, with all the changed parameters their existence imply. Electronics executive and governmental consultant Richard R. Landers has coined the neologism “dybosphere” to designate the new environment of increasingly mechanized men and humanized machines (Jacques Ellul uses the term “inversion” to signify the cross-over from a man-dominated to technology-dominated environment). An example of the dybosphere is the proliferation of synthetic or mechanical human parts or organs—from steel and plastic joints to electronic prosthenic devices or pacemaker/stimulators. There is a medical-school training mannequin at the University of Southern California that simulates breathing, heartbeat and pulse, opens and closes its eyes, dilates its pupils, can open its mouth and stick out its tongue, gags and vomits and precipitates educational havoc by having a heart attack. In “2001” Kubrick exploits this notion both playfully and seriously. Hal, whose voice sounds more like a Madison Avenue hairdresser’s than a Cape Canaveral mission controller’s, speaks to cosmonauts Bowman (Dullea) and Poole (Lockwood) with a carefully refined condescension. At one point when Bowman has been sketching the three crew-members who are “hibernating” in life-sustaining mummy-cases, Hal solicitously asks if he might see the drawings and then compliments Bowman on his improving style. He easily beats his human counterparts at chess, of course, and even gets huffy when Bowman wonders aloud if Hal might have made a mistake—a very significant irony since Hal is, in fact, covering up a deliberate lie with his show of puzzled indignance. With obvious relish, Kubrick has rendered the cosmonauts rather mechanical, while Hal radiates emotion and personality. The inversion creates an atmosphere of vague menace, which becomes palpable when Bowman and Poole, anxious to discuss the mission’s auspicious irregularities out of Hal’s earshot, seek privacy inside one of their ship’s mobile space-pods—where Hal records their entire conversation by reading their lips through an observation port in the pod. Later, recognizing, the cosmonauts are close to discovering his mutiny, he “murders” Poole by sending him out to repair an imaginary malfunction, then causing the mobile pod to shear Poole’s life-lines. The clinically horrifying vision of man at the mercy of his “tools” is epitomized in a grisly scene in which Hal kills the hibernating cosmonauts. Charged with monitoring their life-processes (visually displayed as blips rhythmically crawling across indicator screens), Hal simply “turns off” their lives. The might of these electronic pulses, their peaks and troughs slowly dwindling into feeble straight lines then fading altogether, is a cinematic conceit much more arresting than, say, watching Bette Davis get the bug-eyed life choked out of her in Cineramic close-up. However emotionally loaded, this “murder” scene jars the mind as well as the eye with a stark violence with which we have not been saturated by commercial media. 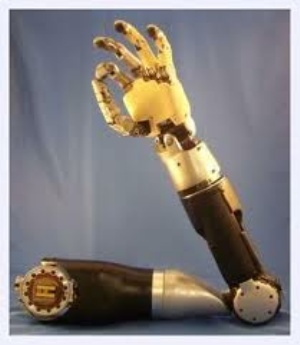 Bionic Arm –Positive Signals in the Man-Machine symbiosis. Just as MacLuhan, who acknowledges his debt to Ellul’s thought, speaks of things “mosaically,” Ellul attacks the problem as it actually exists—as a mosaic of interrelated machines exercising a comprehensive influence over man, who moves from one machine to another in the course of his daily life. He employs an example favored by technological optimists to push the soothing neutrality argument—the automobile—to illustrate the fallacy of considering not the network of machines but a single machine. The automobile cannot run without its driver, says this illustration, who controls it with steering-wheel, brake, clutch and accelerator. Very reassuring, replies Ellul, but it is not one but millions of automobiles we must deal with. Certainly, the neutralist’s notion is not very consoling to the urban commuter or weekender in New York, Rome or Tokyo caught in the creep-and-curse traffic jams. The city of Los Angeles gave up almost 70% of its urban space for highways, roads and parking lots to accommodate this neutral machine. Carbon monoxide is neutral, too, Ellul grouses; but introduced to a roomful of people, it can have disastrous results. The atom bomb, he suggests, might have taught us the value of the reassuring neutrality principle, adding acidly, “Who can call himself the master of atomic energy?” Watching “2001,” I could not help but think about that remark of Ellul’s, perhaps for two reasons. First, the network of machines, the technological environment, is probably the primary message of the film. Second, remembering the humorous anti-bomb propaganda of “Dr. Strangelove,” I recognized that Kubrick had gone rummaging through the second Pandora’s box to be opened in our century—which might roughly be characterized by computers and cybernetics and the astonishing exteriorization of knowledge that is endemic to technological information. As we turn over more and more of our cerebral home-work to computers, we have hardly even begun to contemplate possibilities such as a computer coming up with something—implicit in its memory but a cross-reference of information too diffuse to be recognized by its human programmers—that make the Doomsday machine look like a Chinese firecracker. Still from Psychedelic Time-Warp Sequence – Hurtling into Puzzling Dimensions. Despite the quality of humor “2001” brings to its audience, the philosophical gravity doesn’t suffer. And while the “answer true” is as far from us as the planet Jupiter towards which (out-of-control) the Discovery speeds, the question—posed with astonishing visual novelty and thoughtful authenticity—is in the air as well. But it is not merely ideas or speculations that are floating around up there in the Metrocolored ether. Up in the air, too, is the audience during most of “2001,” which performs some eerily disorienting spatial tricks on your inner-ear. At one point, the two cosmonauts stride through the slowly revolving “centrifuge” section of the Discovery, and the audience is lofted above their titanic treadmill on a ponderous, visual ferris-wheel ride. A female cast member takes a surprising 360-degree stroll up one side of a circular passage and down the other in her Velcro-soled winklepickers. As the subliminal theme of revolution is visually spun out by slow-rolling, spheroid or wheel-shaped spacecraft, one gets afflicted by various forms of the dizzies. And there is that much-heralded supersonic Cresta-run through what could be an exploding paint factory as Rowman gets sucked into another dimension on his way to Jupiter. This kaleidoscopic, nearly five-minute Catherine-wheel of psychedelic effects—which are technically most intriguing—leaves you feeling like a limpet somebody has pried off a rock and pitched into a cyclotron. The purely visual, spatially disorienting side of “2001” depended on a monumental scale and novel illusion of motion, which were present in two other film events shown in London. One was a “Multiscreen Festival” (in two words, Expo revisited). The other was a series of macro and microscopic teaching films made by members of the Oxford Biological Film Unit. Both seemed to be a spin-off from the wide-screen grandeur of Kubrick’s movie and both conveyed an arresting impression of how changes in focus and scale can reveal, and saturate one with, our normal environment perceived in a new way. All but two of the multiscreen films shown at the Odeon in Leicester Square had been projected in the incredible audio-visual hurly-burly of Expo 67, where the film fare was so heavy I ended up feeling like a goose being force-fed to fatten its liver. But a second viewing in the calmer surroundings proved no less riveting than the first, although it did bring up some second thoughts about film process and content, between which there is a fairly wide gap. Expo’s movies were, after all, an almost pure MacLuhan example of the medium being the message. The content and working idioms were very similar—partly inevitable since Expo was a grand, international theme event. And international themes do not vary that much. The content was picturesque, optimistic, sweet, sometimes chiding with an occasional mushroom cloud; but basically it conveyed the kind of impression one gets from looking at UNICEF Christmas cards. Process—multiscreens, multiple images, films with architecture, films as architecture, movie environments and cinematic surfeit like a Savarin banquet that courtiers can’t possibly finish—process was the pièce de résistenace of Expo’s audio-visuals. And there it was, filling millions of people from every level of society with awe and raptures: screens six times the size of Cinerama; fifteen different images on a single screen, playing Mondrian hopscotch; circular cinema on all sides—you hardly knew which way to turn; mirrored infinities in which to lose yourself; landscapes looming like skyscrapers; movies and live actors mixed in an eye-baffling meld; nature’s inscrutables blown up 20 feet high and even a chance to stop the drama and play director. An event such an Expo does not make for an acutely critical audience yet even a captive audience requires something more than superficial spectacle to induce it to stand in lines four, five or six hours (literally; there were seven-hour waits at Labyrinth) to see the cinematics, which somebody calculated would have taken six months to see entirely. But millions visited them or read about them, so the bright promise of audio-visual process at Expo is a fairly well-known story. It brings to mind an irony: in 1908, Russian author Leo Tolstoy said of the moving picture, “You will see that this little clicking contraption with the revolving handle will make a revolution in our life...The cinema has divined the mystery of motion. And that is greatness.” Sixty years later, the great cinematic revolution is just beginning—as advances in pure film technology and image production such as video tapes, computer-aided composition and editing, synchronized multiscreen and multicamera movies or innovative concepts such as Kino Automat or Laterna Magika begin to be employed--albeit employed only sporadically or on such a scale primarily because of prestigious, one-shot ventures such an Expo. But, as one remembers the New York World’s Fair or speculates on Osaka, if these global events are to be increasingly the stage for audio-visual research and development, what better way to test and rehearse potential methods of entertainment and education for tomorrow? It takes that kind of money . One sly critic, discussing Expo, cited a line from Richard Lester’s “How I Won the War,” in which a character says “War has brought about some remarkable advances in surgery.” And so it has. Expo’s movies were examples of the environment we all see, but perhaps do not register, revealed on a new scale and with an unfamiliar intensity. The teaching films produced by the Oxford Biological Film Unit focus on an environmeht, no less pervasive than that revealed at Expo, that we normally do not see—the mini-scaled world of zoological life, the marine diatom, the tiger beetle, the unremarkable fish louse; unremarkable until he assumes the proportions on a movie screen of Raquel Welsh from the neck down. The films were screened at London’s National Film Theatre to a film-club audience used to the usual fare of Godard, Fellini or the Underground. It looked to me as though they were just as fascinated by microscopic scenes of fish lice mating as they had been during the voyeuristic passages of Andy Warhol’s “The Chelsea Girls,” which had been shown previously at the National Film Theatre. The film Unit (OXBU) is comprised of four Oxford zoologists and biologists who have produced prize-winning science films which have been widely shown on British television. They operate at the moment within the confines of the university, but have hopes of “going commercial” while still retaining an Oxford link. An American manufacturer of teaching aids, Ealing Corp., in Cambridge, Mass., has OXBU under contract to produce film loops for its projectors and the unit regularly creates films for television. It all began, as these enterprises often do, in a basement—where George H. Thompson, a member of the university’s Forestry Department, decided to shoot a film on the alder wood wasp and its parasite enemies. The film, most of which was shot in the basement studio Thompson has filled with a gargantuan array of heavily-weighted filming equipment, subsequently won six major awards, including the Grand Prix at the 1961 Science Film festival which was part of the Venice Film Festival. After Thompson had done other insect films, the bug bit some younger Oxonians. All in their 20s, the younger members of the unit are Peter D. Parks, a zoologist and accomplished scientific illustrator; John E. Paling, a zoologist who schooled at Birmingham as well as Oxford, and Sean R. Morris, also a zoologist. With Thompson, they have developed some innovative techniques in macro- and microphotography, such as a vibration-beating optical bench that facilitates high definition in dark-ground photography. Basically, the bench permits subject and camera to vibrate in tandem and renders possible a higher degree of backlighting—and a generation of more light than heat, which is critical in high-magnification photography. One OXBU film zooms in on a flea digging into the skin of a rabbit, then shifts from this jungle of hair to parasites on the flea—“a tricky problem of lighting if you don’t want your flea to burn up,” says Parks. Parks and Paling both have been awarded grants of 3,000 pounds by Kodak for further research, Parks for his optical bench-work, Paling for aquarium photography. The group is also exploring the latest in technology for aids in penetrating the world of the hidden forms of nature, including endoscopes and X-ray. While their work is basically geared to practical teaching films for education, industry or television, their films—and their stars—possess a lateral sort of artistry that is readily recognizable. Obviously, these films are as difficult to describe verbally an Expo’s are. An example of their kind of scale-shift appeared in Jacques Yves Cousteau’s “World Without Sun”—in a delightfully witty sequence of diatoms, microphotographed in polarized light, shimmying across the screen to the tempo of a sprightly score. A research physician in Rochester, N.Y., has produced a micro-scale film on the reproduction of the slime mold, in which a score of semi-classical musical selections in changing tempos backs up the visually time-lapsed morphologies of the burgeoning mold. Watching luminous plankton the size of pin-points waltz across the National Film Theatre screen during the OXBU program, or the diaphanous, jitterbugging jellyfish flouncing by, one could hardly help thinking of modern art forms, which often mimic once-hidden forms in nature. Gyorgy Kepes, whose courses at MIT combine art and science, once mixed photographs of modern art works with micro- and telescopic scientific images to illustrate the surprising similarities between the artist’s inspiration and nature’s infrastructures. The OXBU cineasts constantly find such correspondences in their footage. Paling’s studies of Argulus, the fish louse, which he films settling in on a stickleback’s tail, show the circulatory system of the parasite as an incredibly delicate espalier in one full-screen close-up. In the course of filming, Paling noticed some potentially fascinating visual effects in the stickleback’s blood circulation. In a sequence at X400 magnification, we see the veins in the almost transparent rays of the little fish’s tail, but blown up so large that they resemble hematological freeways, each coursing with opposing lanes of corpuscular traffic that comes spilling out of the capillaries like cars spilling onto the Connecticut Turnpike after the Yale-Harvard game. But even the macrophotography subjects fill you with associations—the balletomane postures of insects depositing eggs or the odd, Kabuki rhythms of the mating dance. There is a fabulous phase of Thompson’s tiger-beetle film in which the green-gold predator, one of the insect-world’s most voracious, stages a banquet scene of crunching mandibles and slavering gluttony that beggars the eating scene in “Tom Jones.” One of Thompson’s spider films has a hilariously effective Hitchcock flavor. “And now we shall see the capture of a wasp,” intones Thompson in the scare-scholar’s deadpan tone, while a close-up of the spider’s working jaws hits you like the gigantic machinery of a steel-stamping production line. The spider in the film, incidentally, is photographed in its home in a hole on the wall of the Houses of Parliament. As he patiently waits for his prey to sail into his snare, the camera gaps the time lapses by panning up to the clock in the tower of Big Ben and then back to the tiny lair, which periodically emits a desiccated carcass which the camera follows elegaically to its final resting place in a pile with others. Is it possible for the layman not to wax anthropomorphic in response to these films? Maybe, but we don’t spend much time squinting into a microscope and watching diatoms and blood cells in human scale drag the mind in the direction of human associations. Most “nature” films screened on a popular level—like Disney’s—follow a semi-anthropomorphic storyline, and do not normally take us into the realm of nature’s structural abstractions. A snowflake’s skeleton, the fretwork of a dragonfly’s wing, the art nouveau end of a peacock feather—these we probably recognize readily. But a single-frame photo of a stickleback’s capillary would doubtless be read by average viewers as an abstraction. Which was perhaps the point of the OXBU films for me, aside from their primary educational purpose: they sharpened and extended one’s appreciation of abstraction. The idea that the films would turn on artists, dancers or other filmmakers was apparent in the films being chosen for that sort of audience whose enthusiasm was vocal. It probably seems a long and circuitous jump from “2001” to OXBU’s mighty mites, but watching both worlds in wide-screen, one saw striking similarities in scale, image and associations. A cool flea looking up at our man-sized world can evidently make the leap. Received in New York July 18, 1968.